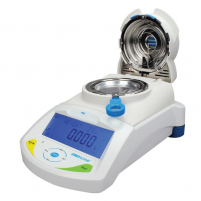 The Unity Scientific M18 Moisture Analyzer delivers in 30 seconds accurate analysis of the moisture and total solids content in unground, ground, slurry, paste and gel products in manufacturing processes. Moisture analysis is a critical component of process consistency and efficiency. Accurate and precise moisture control enables process optimization by controlling mixing, drying and heating processes.